I have a friend at church who competes on the BBQ circuit. He typically mans the grill when the United Methodist Men (UMM) meet during the summer. Last month, after a succesful meal of grilled pork steaks, the guys decided they'd like to have ribs at the next meeting. Well, that turned into a two man job. We decided that we would take the day off and plan to cook at the church. We also decided to press my Backwoods Pro Jr into service. Paul and I moved my cooker to church that morning and he trimmed the spare ribs down to St Louis style ribs while I put together 2 pans of my "magic" beans. Paul uses Code 3 spices when he competes, so we decided to use them for this cook as well. We roughly followed his competition process, which means we wrapped the ribs in foil with brown sugar and butter, then finished them out of the foil and glazed them with sauce. We also decided to do the rib tips at the same time, following the same process. It's a good thing we did. We had a great turn out. Everyone enjoyed the meal and fellowship. Next month, we're frying fish! It started a couple of years ago. A good friend of mine asked if I had room on the smoker for some pork butts to feed some of the guys at Scott Air Force Base during a fall exercise. I did, so we sent some BBQ to the base for the team. Four years later, it's become a standing order and we've jokingly named the event "Operation: Hickory Smoke". Every fall, we send some BBQ to the folks involved in this exercise. This year I was able to visit the team and participate in the delivery. It was pretty cool to meet a few of the folks who were going to enjoy the meal. I also received a nice note from one of the officers. Veteran's Day may be next week, but I'm honored to have shown my appreciation in a small way with this annual event. To the team working the exercise and all those who serve or have served, I say thank you. That's what we did on Saturday. As I mentioned in "Que for a Cause - Round 2", I cooked BBQ for a fundraiser this weekend. It's amazing what a group of volunteers can do when they come together for a cause. On Saturday afternoon, ~90 golfers teed off in a scramble format. The plan was to feed them pulled pork around 5:30 or so. Little did they know that I began the process of feeding them at 2:00am. That's when the pork butts went on the smoker. They were finished and resting in the Cambros by early afternoon. I knew that I'd have the meat done well before serving time, but I also had to allow for travel time and time to pull them when I arrived. Up until then, the plan was right on track. But when I arrived, I discovered that the golf round was running long. I mean waaaay long. We didn't begin to feed the golfers until nearly 7:00pm. Thankfully, the Cambros did their job and I had piping hot BBQ that was still too hot to handle. Disaster avoided. Here are a few random shots of the cooking process and the event. Special thanks to my bride for assisting with serving. My family and I are blessed to be part of a growing, thriving church. Christ Church in Fairview Heights, IL has grown beyond the capacity of it's real estate and has begun to sprout new churches in the Metro East area of St. Louis. 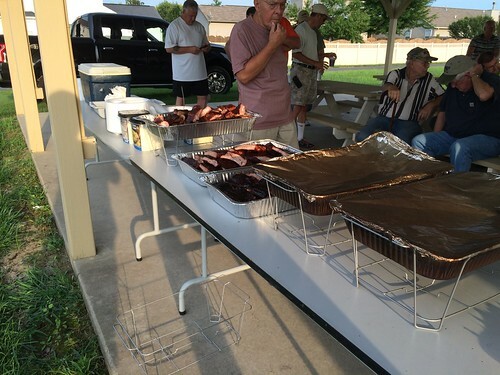 Our satellite campus in Millstadt, IL recently held a church picnic and I was honored to be able to prepare the BBQ for the event. They expected 80 for luch, I planned for 100, and we probably had closer to 70. Not to worry, I always travel with zip lock bags so folks can leave with a doggy bag. Heck, I even got to bring some home and feed my own family. In any event, I fired up the big cooker on Saturday night for pork butts, chuck roasts, and my pit beans. After an all night cook, I had eveything ready around 9:00am. I even fired up the charcoal grill and roasted some hot dogs since I figured some of the kids might prefer that (I was right). I had everything setup at the park when church let out shortly after 11:00. Folks seemed to enjoy the food, and I felt blessed by their compliments and for the opportunity to cook for my church family. For the past few years, I've manned the BBQ pit in support of Jacob's Ladder and their annual BBQ & music event called Pig-a-Palooza. The event has a lot of momentum and this year was the best yet. For the second straight year, we've donated BBQ for a private party as part of a silent auction item. This year, it was part of an auction package that included a miniature version of the entire Pig-a-Palooza event including side dishes, wine & beer, pulled pork and ribs, and live entertainment. The lucky winner of this year's auction item selected October 6th for the date of their shindig, and we put the wheels in motion. 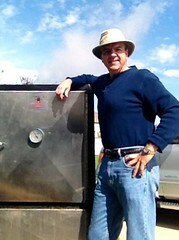 So Saturday morning, I was up early stoking the smoker for the BBQ. Getting pulled pork ready for a couple of dozen people is pretty easy. Heck, getting ribs ready for a couple of dozen folks is pretty easy. 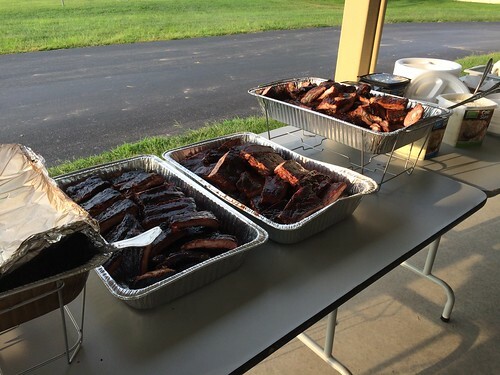 But, my bride also chose this day as one of her customer appreciation days where we cook ribs for friends, clients, and colleagues of The Bradshaw Property Group. That means 24+ racks of babyback ribs. Now that's a lot of work. Pork butts went on the cooker by 6:00am and at 10:30am I began the prep of the ribs. Prepping that many ribs single handedly takes some time. Did I mention that it's a lot of work? But I had ribs on the Backwoods by 11:30am. My timing was spot on! 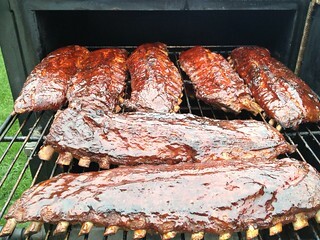 I had the butts wrapped by 4:30pm and resting in the Cambro, and I began the process of glazing and finishing the ribs around 4:00pm. Friends, clients, and colleagues began pickingup thier customer appreciation gifts around 5:00pm, and I headed out to Mini Pig-a-Palooza at 6:00pm with a second Cambro full of BBQ goodness. We gloved up and served the party goers to rave reviews while a friend of mine, Steve Reeb, entertained the good folks. My co-pitmaster, Dave Dey, and I took up the guitar for a miniature set of our own while Steve was on break (thanks for being so gracious Steve!). All in all, we had a great time and look forward to next year's Pig-a-Palooza. We're closing in on the date for this year's Pig-a-Palooza event. Once again, my good friend and co-pitmaster and I will man the pits and crank out pulled pork and ribs for a few hundred folks. We always have a great turnout and raise money for Jacob's Ladder. This year, there will once again be silent and oral auction items, games and activities for the kiddos, food & drinks, and an evening concert by the St. Louis band Dr. Zhivegas. So mark the date of June 2nd on your calendar and plan to come by for some good BBQ and good times. WOW! 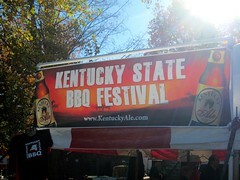 That's really all I can say about the innaugural Kentucky State BBQ Festival. 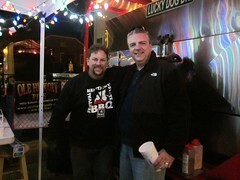 Brad & Cindy Simmons of Lucky Dog BBQ contacted me a couple of months ago about an idea that they had to create a festival atmosphere where competition quality BBQ was available for purchase by the public. You see, BBQ competitions are all the craze these days but you can't sample or buy the BBQ that the teams prepare. They only prepare enough for the judges and since they travel all over competing, they aren't certified by all the local health departments to serve the public. Brad & Cindy's idea was to emmulate the Big Apple Block Party format and have competition teams prepare their specialties and make it available for purchase by the public. They coordinated with a half dozen teams and the health department, and then threw the gosh-dangdest festival I've been to in awhile. Big Moe Cason of Ponderosa BBQ, Craig Kimmel of Firehouse BBQ, Carey Bringle of Peg Leg Porkers, Melissa Cookson of Yazoo Delta Q, Shelly Hunt of Desperados BBQ, and Brad and Cindy of Lucky Dog BBQ were the featured attractions, serving their competition grade BBQ. But there was plenty more to take in. Ray "Dr BBQ" Lampe was on hand for cooking demonstrations on the Big Green Egg. 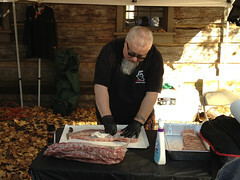 Shane Draper of Draper's BBQ was there with his awesome new rubs and sauces. And there was a wide varity of vendors displaying their wares and an excellent selection of music throughout the day. I spent some time getting photos and taking in the festival, but I spent a good part of the day on Saturday pitching in to help the Peg Leg Porker team handle over 1,000 customers. 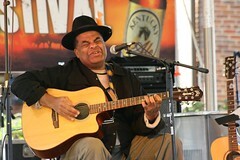 The festival began at 11:00am and by 4:30pm, Peg Leg was sold out of his Memphis style pork shoulder sandwiches. Lucky Dog was out of brisket about the same time, and all the other teams ran short on at least one item. For a first year event, the turnout was phenomenal. Firehouse BBQ took home the People's Choice award, but with the turnout and incredible November weather, all the teams were winners. I sure hope this becomes an annual event! Here's a link to a few more photos. The countdown is on. I'll be heading for Danville, KY on Friday to attend the Kentucky BBQ Festival. There's a weekend full of events planned and I'm looking forward to reconnecting with some of my contemporaries and making some new friends. If you're within shouting distance of Kentucky horse & bourbon country, stop in and check out all that's happening. If not, stay tuned to Grill & Barrel for regular updates, photos, etc. 10:00 PM KY BBQ Festival Closes See You on Sunday! Through our efforts this weekend, I'm pleased to announce that Pig-Con Delta was averted. I received this traffic from the Kulinary Command Battle Staff (KCBS) commander to let me know that we have completed this exercise and that we'll be doing it again next year. 1. BY ORDER OF LIEUTENANT GENERAL HARWOOD "LUMPY" CHARKOAL, COMMANDER KCBS, ALL "PRO JUNIOR" FORCES ARE DIRECTED TO STAND DOWN AND RESUME NORMAL OPERATIONS. 3. THE COMMANDER AND HIS ENTIRE STAFF EXPRESSES THEIR DEEP APPRECIATION FOR YOUR PATRIOTISM AND DEDICATION TO THE MISSION (REAL WORLD). DUE TO YOUR EXORDINARY EFFORTS, ADVERSARY "GRUMBLING BELLY" HAS BEEN SUPPRESSED. 4. FOR FUTURE PLANNING PURPOSES, EXPECT AN RFF (REQUEST FOR FOOD) FROM KCBS ON OR ABOUT 23 OCT 2012. THIS RFF WILL INCLUDE DIRECTION FOR TF BACKWOODS TO EXERCISE DEPLOYMENT OF THE RAGING INFERNO BRIQUETTE SYSTEM (RIBS) AS A CONCEPT DEMONSTRATOR. I never served, but I can support those who do. And the best part is that I can do it with something that I love to do; BBQ!